To close the Sci-Fi Month series of posts I’ve put up in November I decided to go back and give some recommendations about some of my favorite sci-fi books and series of all time. Since my husband has been reading science fiction much longer than I have I also asked him to contribute some of his favorites, which are after the dividing line below. 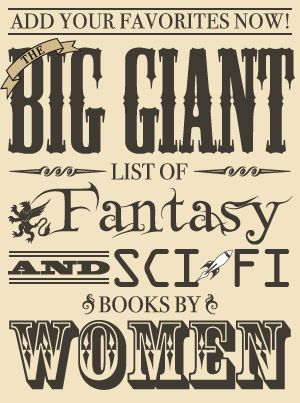 Of course there are a lot of good books that we’ve left out, but the ones we’ve included are some of the best of the best and we think they’re great books for anyone who is into (or wants to get into) science fiction! 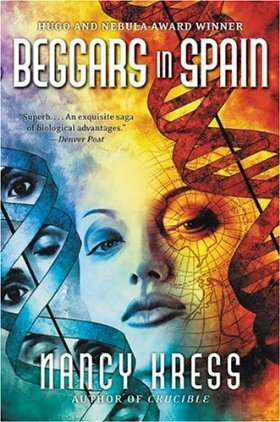 This is one of those series that can be a bit daunting to begin—there are 18 works listed as part of the series on the author’s website, including 14 novels, and the books in the series are not published in chronological order. 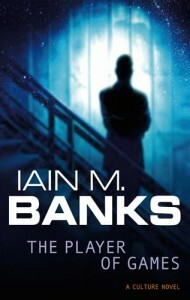 Skyfall is the first novel in chronological order, but while I enjoyed it, I didn’t think it was as good as some of the other books in the series or a necessary starting point. I’d recommend beginning with either Primary Inversion (the first in publication order and the book I started with) or The Last Hawk (my favorite in the series). 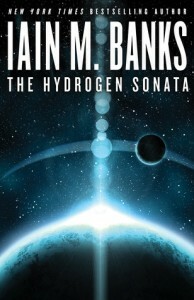 I must confess I’ve only read five of the novels so far myself, but since both Primary Inversion and The Last Hawk are among my favorite science fiction books I had to include them on this list! I love how well-rounded the books in this series are; they contain hard science, action and adventure, romance, fascinating societies, and interesting characters. Primary Inversion focuses on Soz, a fighter pilot in Skolian Space Command and the Emperor’s sister and heir, who meets and falls in love with a man belonging to the enemies of the Skolians. It’s been awhile since I read this one so my memory of the details is a bit hazy, but I found it a good introduction to the Skolian Empire and a difficult book to put down. The Last Hawk focuses on Soz’s brother, Kelric, who ends up on the planet Coba when his ship’s last engine fails. Coba was a very interesting place, due to both the role of the game Quis in their society and its matriarchy, and this was another book I found I could not stop reading. Thinking about these books has made me want to pick up one of the others I haven’t read yet! 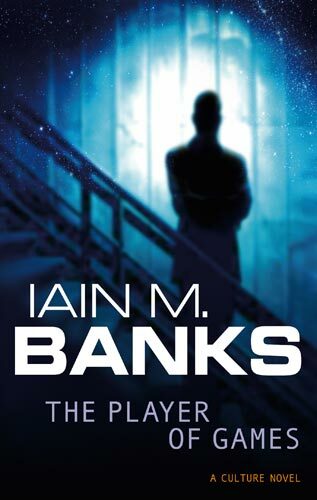 While I still need to read a lot of the Culture novels, I had to include them because The Player of Games is one of my very favorite science fiction novels! 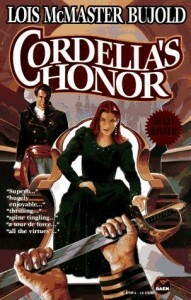 As mentioned with the books above, I love books in which games play a role in society and this particular novel features the empire Azad, where the ability to play a game with the same name determines the position one has with the best player ruling as Emperor. 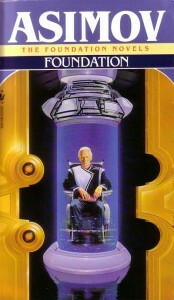 This was my first Culture book, and I thought it was a great introduction to the universe with its ideals. It’s an egalitarian utopia and many of the problems humanity faces are not an issue in the Culture, like money and disease. Basically, it’s one of the first places that pops into my mind whenever the question is raised about places in science fiction and fantasy books in which one would like to live. It’s not perfect, but it sounds like a pretty decent place to be for the average person! I also love the ship AIs and their names (ie., So Much for Subtlety, Screw Loose, Just Read the Instructions). 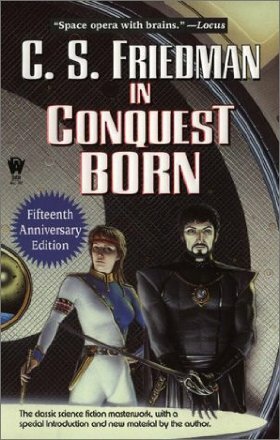 While I had some problems with the jarring point of view switches and slow beginning, I very much enjoyed C. S. Friedman’s first novel about two peoples at war (I’m starting to see a trend with science fiction books I enjoy). What I really appreciated about In Conquest Born was that it had a lot of focus on political machinations and enemies trying to outsmart one another and managed to pull them off well. Often books about intelligent people tell readers they are smart without successfully showing them as competent, but C. S. Friedman succeeded in making her characters fit within the parameters of what readers were told—and also at making them complex and interesting to read about. Nancy Kress has won a large number of awards for her fiction, and her trilogy beginning with Beggars in Spain is also wonderful (but I’m going to let John talk about those since he’s read them all numerous times!). 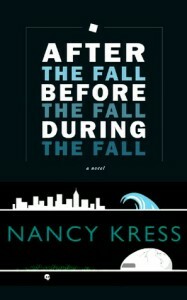 After the Fall, Before the Fall, During the Fall is a novella about what happens before, during, and after an apocalypse. It switches between timelines in a way that sets up some compelling questions about what exactly happened, and I thought it was very skillfully done. The very first chapter, in which a boy born after the apocalypse went back in time to abduct some children, had me riveted. I was very impressed by how much was conveyed in such a short book, and I also found it to be a real page-turner, as cliched as that sounds. 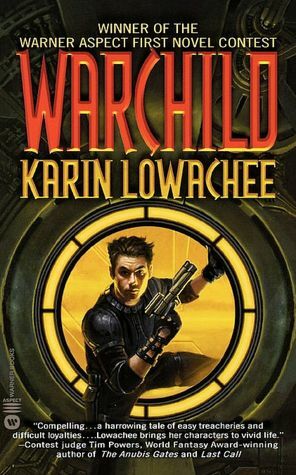 Normally I wouldn’t include the very last book I reviewed in a list like this, but Warchild is now so close to the top of my list of favorite books that I cannot possibly leave it off a list of science fiction book recommendations! The story begins when eight-year-old Jos Musey’s ship is attacked by pirates, leading to his eventual escape with an alien sympathizer who makes Jos his student in the war between EarthHub and the aliens. It has one of the most intense openings I have ever read since it is like being right in Jos’s shoes as his ship is attacked and he and the other children are taken by pirates. I also enjoyed that the war was complicated and there were flawed but ultimately decent people on both sides, and I just loved Jos as a character so much. He’s had it so tough, and I was incredibly emotionally involved in his plight. I can’t recommend this novel enough to those who don’t mind some darkness in their fiction. 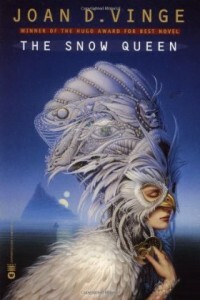 This novel, loosely based on the Hans Christian Andersen story, won the Hugo Award in 1981. The planet Tiamat’s ruler alternates between a Winter Queen and a Summer Queen, each of which reigns for about 150 years. As the Winter Queen’s rule comes to an end, she is reluctant to give up her place and has some clones created in hopes that one of them will succeed her as the Summer Queen. The Snow Queen is largely the story of the one clone who could become Summer Queen, Moon. While it could be slow at times, I thought this book tied together very well in the end and I loved the characters and the divisions between the Winters and the Summers. I really need to pick up The Summer Queen at some point; it’s a massive book that will take me forever to read but I’ve heard it’s even better than The Snow Queen! When Kristen asked if I wanted to add something to her sci-fi recommendations post I said I’d be happy to. After all, I’ve read it my entire life and I’ve even written about sci-fi related matters on this site before; what could go wrong? Well, as it turns out, I have read it my entire life. That fact means that, not only is there a lot to choose from, but I’ve also read them at different times in my life when I’ve valued different aspects of the stories in them. I can’t just make a top ten list because the books are good for different, largely incomparable, reasons. 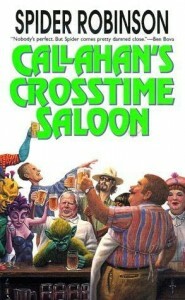 Is reading about Callahan’s bar better than reading about Miri and her SuperSleepless? It’s like asking what tastes better, blue or logarithms? So instead, I’m giving a few of the reasons why I like to read science fiction and a couple of exemplary books that highlight those characteristics. The categories are at least some of my answer to the question of what makes sci-fi worth reading, and the books are my answer to what makes sci-fi good. Callahan’s bar is a transtemporal, transdimensional, and sometimes transsexual saloon where interesting things happen to unusual people. It’s unapologetically optimistic and believes that most people can be good while also knowing how to effectively deal with those who can’t. That’s about as narrow a description I can give the series because Robinson grabs bits and pieces from all over the place to populate his bar, but somehow all the odd bits work together to make a cohesive whole. Many of the best Callahan tales are short stories, so I’d recommending picking up a collection like Callahan’s Crosstime Saloon to get started. Phule’s Company is Asprin’s lesser known sci-fi counterpart to his more famous MythAdventures fantasy humor series. It’s set in the military of an interstellar empire–or at least, a military-of-sorts, since they’re much closer to mercenaries. The company is essentially a French Foreign Legion in space, filled with people who are trying to get away from their pasts who join in pursuit of the only real benefit service provides: anonymity. This particular company is run by one of the richest men in the universe, Willard Phule, who happily takes what sound like military problems and solves them with business sense and cash. 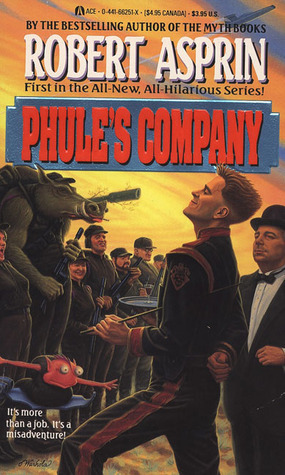 The Phule series has the same humor and humanity that made the Myth books popular but manage to avoid a lot of the problems that dragged that series down when it was at its height. 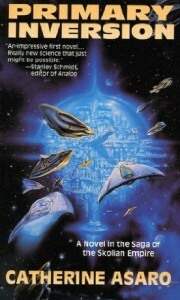 Ilium and Olympos are escapist in a completely different way than the Vorkosigan Saga. While Vorkosigan appeals to the sense of narrative and play, Simmons’ books appeal to the intellect. 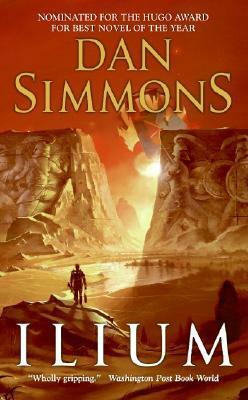 Set in a bizarre-but-functional collision between Mars and Troy, these books pull together incredibly disparate threads from across time. You truly need to be a scholar of English (and often Greek) literature if you’re going to pick up on all of the references and allusions Simmons drops in. The key, though, is that Simmons manages to do this without making readers feel like they’re doing hard labor to understand what is going on. It’s a little bit of the technique used on Lost: leaving breadcrumbs to tempt you into following up and hint at deeper connections but not making the story dependent upon following up on those hints. Luckily, Simmons is a vastly superior writer to anyone who worked on Lost and his story actually, you know, comes together in the end. I’ll lump these together because the odds are pretty good that, if you’re this far into a post on sci-fi recommendations, you’ve probably heard of these books already. 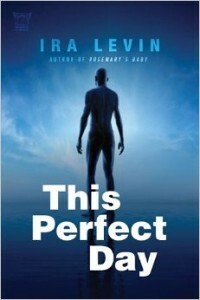 The possible exception is This Perfect Day, the most recent book on the list (from, uh, 1970), but it is similar to the others in tone and feel. I believe that part of sci-fi’s mission is to make us think about the world we live in and, more importantly, the world we want to live in. These dystopias all warn against different versions of worlds gone wrong. They don’t come with the trappings of most recent books, for better or for worse; they are about ideas over empathy and societies over people. Readers who are used to modern sci-fi may have trouble with them because of that, but they are at the core of what it means to tell a science fiction story and so I still recommend them to anyone who is interested in the genre. On the other end of the dystopian axis are books set in utopian societies. I wrote a post about Asimov’s universe a while ago that goes into much more depth than I’m including here so I’d suggest you read that if you are interested in his universe (which I’ll defend as broadly utopian, though certainly a utopia complicated by reality). As Kristen discusses above, the Culture series is a modern take on interstellar utopias, filled with books where technology is neither the cause of nor solution to the problems of the galaxy. Instead it’s all about the societies and people in them, particularly the less developed ones that provide wonderful contrast points with the near-utopian Culture itself. This is another series I’ve written about before on this site. Several times, actually, and with good reason: Beggars in Spain has stood atop my list of favorite books for nearly two decades and there have been very few books I’d even consider challengers for the title. I’ll again point you to my previous post for more details, but all I can say is this: read it. Now. Yes, I know there’s another paragraph before the end of the article. I don’t care. Vinge is well known, he doesn’t need the publicity. Just go find a copy and dig in. 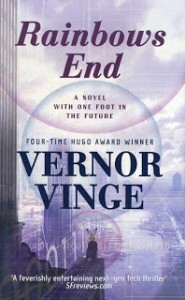 Kristen and I have somehow managed to skip Rainbows End when we reviewed several of Vinge’s other books here, but suffice it to say that it continues his long history of excellence in both form and concept. It is set in the rapidly-approaching year of 2026 when virtual communities and augmented reality have created the opportunity to choose the world you want to live in and the people you want to interact with. I’ve found it an incredibly prescient book and have recommended it to my New Media students for years as a story that understands the implications of new technologies on society. That it manages to portray those implications embedded in such an interesting story is part of what makes authors like Vinge and Kress exemplary.